The Sheboygan Falls United Football League aims to teach young people the values of: Teamwork, Discipline, Effort, Sportsmanship, Courage, Sacrifice, Dedication, Citizenship, Fair Play, Respectfulness, and Toughness through spirited competition in the excellent game of football. Kids will be sent home and games will be rescheduled. Games or Practice will Procede in the event of rain. 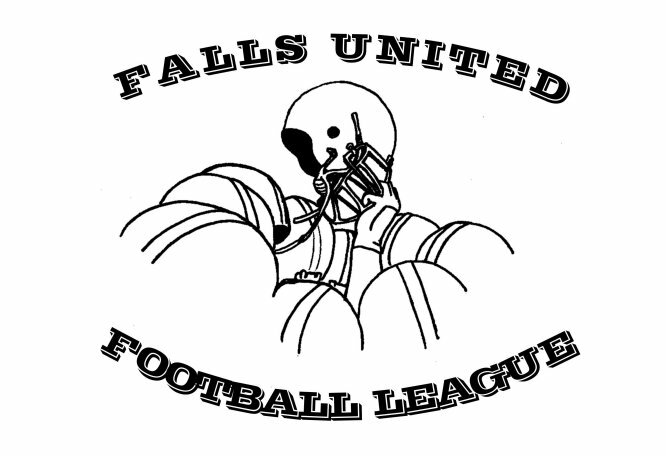 FUFL participation (intramural) is free for members of the Falls School District. during September and October it is typically Tue, and Thur. 1. What constitutes a “family member”? a. Son, daughter, stepson, or stepdaughter. Parents must be married in the case of a stepson or stepdaughter. 2. Commitment of a parent. a. The head coach must contact players before the season begins and determine whether or not any players will be returning to play football in the upcoming season. If any player says he/she is quitting, the head coach has two options. 2. The head coach can fill that roster spot with a different player, and the player that quit is no longer eligible to play football in the league that year. 3. League president is to contact parents of players that quit to inform the parents of the rules regarding quitting. 1. Seniority. Head coaching position changes by seniority only except for travelling team coaches which must be nominated and voted on annually. If there is not a coach with five (5) years consecutive coaching experience when a team becomes available, then the next most senior coach (coach with the most combined coaching experience) would be next in line to take the team. 3. Upon taking over a team, if there are any assistant coaches with said team for a minimum of five (5) years, the head coach must keep that assistant if that assistant wants to stay with the team. 4. Must keep league president/director of football operations updated with any contact information changes; i.e., phone numbers, address, email. 5. Provide league president/director of football operations with complete team roster one week prior to first game, to include game jersey numbers, and is responsible to ensure roster changes are updated with the league president/director of football operations. 1. Role models. As leaders of the league, coaches must be held to a higher standard. 4. Attire during league functions. No wearing of anything that relates to alcohol, tobacco, or lewd or suggestive behavior. 5. Attendance. Head coaches and first assistant coaches are expected to be at all meetings, practices, and games. 1. Penalties for infractions of above rules A1-5 will be dealt with by conducting a meeting to discuss infractions with all head coaches, assistant coaches, and any referees that wish to attend. 3 Attendance of all head coaches and one assistant coach per team is mandatory. 4. Attendance of coach under review is mandatory. 5. President will dismiss coach under review from meeting during voting on appropriate penalty. 1. Any Player suspended from school must inform their head coach of any such suspension. 2. Player that is suspended from school is suspended from football for the same number of days as they are suspended from school. This does not include non-practice or non-game days. 3. Head coach must inform league president/director of football operations of any player suspension from school. 1. No player to player contact or sled for three (3) practices/days. 2. Each player must complete three (3) full days of practice with no pads and one full practice with pads and contact prior to playing in a game. Rainouts and do not count. 3. Stand-up dummies can be used but MUST be held by a coach or assistant coach. 4. refer to section VII. Equipment sub A. 1. The Monday following the draft is the first night of practice. 2. Practice Monday through Friday from 6pm to 8pm for the first two weeks prior to school starting. After school begins, practice is on Tuesdays and Thursdays from 6pm to 8pm. 3. If a coach wants to change his practice time on any given day, he must inform the league president. (example, Falls Fest, County Fair, 6th grade Orientation). 4. The president of the league will contact all head coaches to call off practice due to bad weather. 1. It is mandatory that all equipment be turned in at the end of the season. 2. All game and practice jerseys are the responsibility of the head coach of each team. 3. Equipment turn-in has traditionally been done the first Tuesday after the banquet. 1. A head coach can change the name of their team, but head coach must make such name change two (2) weeks prior to the draft. 2. A team’s jerseys WILL NOT be changed until that team’s turn in the order for new jerseys or there is a need for new jerseys. 1. Must have five (5) consecutive years of coaching to be president of the league. b. Will oversee all operations of the league. c. Will conduct weekly meetings of league business during the football season. d. Will direct the league direction upon the voting body approval. e. Make sure all officers are using due diligence upon their posts. f. Attend annual United Way meeting. g. Expected to be at all meetings. 1. Must have five (5) consecutive years of coaching to be vice president of the league. 2. Cannot be from the same team as the president. a. Acts under the direction of the president of the league. c. Expected to be at all meetings. b. maintain records of all minutes of meetings. b. Submitting United Way reports. d. Must keep detailed records of all financials. e. Must provide annual balance sheet to president. g. Supply any annual balance sheet to supporting agencies of the league upon the request of supporting agencies. h. Expected to be at all meetings. 1. The president of the league is responsible to have all parent permission slips and league rule books provided to each head coach on the day of the draft. 2. Kids living outside the Sheboygan Falls school district must pay $50 annually to be turned in with their permission slip prior to participating in the league. Amout subject to change upon decision of the voting body. 1. Each coach will be provided a copy of the league bylaws. The voting body of the league consists of two voting coaches per team and two voting referees. Jr Falcon teams also get two votes as long as no coach votes twice. Coaching an intramural and Jr Falcon team does not give you two votes; with the exception that all league awards are voted on by two coaches from each Pro League team, and one coach from each Jr Falcon team (5th, 6th, 7th, and 8th). The Jr Falcon vote may, in this case, be a coach's second vote. Will be directed by the League President. 1. Team assigned to concession stand required to provide adequate staffing. 2. Each team responsible for opening 30 minutes prior to game time. 3. Facility is to be properly cleaned. Please keep a clean house. between the break of the huddle and the snap of the ball. DE’s can be head up on the TE or Outside, they can be standing. DL may shoot gaps, but they may not stunt. MLB can come up to the line inside the 10 yard line, but he must have a hand and the ground. DE must be head up or just outside the TE or (Tackle if End is split). DB must be 6 yards back unless covering a split receiver. 1. Thirty minutes prior to the start of an activity, and again 60 minutes after the start of that activity, take temperature and humidity readings at the site of the activity. A smart phone app or weather web service that gives the heat index for your local area can be used. ​Note: When the temperature is below 80 degrees there is no combination of heat and humidity that will result in need to curtail activity.